Welcome to our First Grade Addition Worksheets. 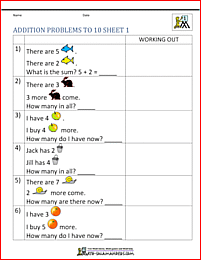 Here you will find a wide range of free addition worksheets for first graders, which will help your child learn to write and use addition sentences up to 12. 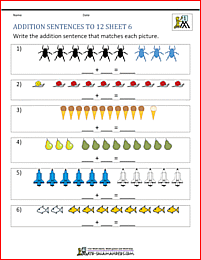 Using addition sentences is a great way to give children a picture of what addition is and how it works. 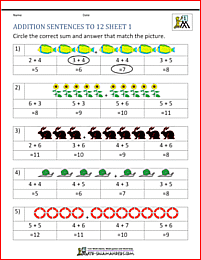 The sheets on this page are ideal for children starting out in first grade, or children who need help understanding what addition is. The sheets on this page are all about understanding and using addition sentences up to 12. For example, in the image above, we have a picture of 6 starfish, 4 of which are orange, and two of which are blue. This shows us the addition sentence 'four starfish add two starfish is six starfish', or 4 + 2 = 6. Being able to understand addition sentences can be quite tricky for some children, and they need to be confident at counting first! 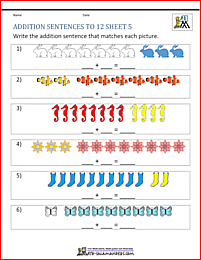 Write and match addition sentences up to 12. 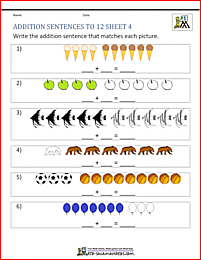 The first three sheets involve matching and selecting the correct addition sentence to match the picture. 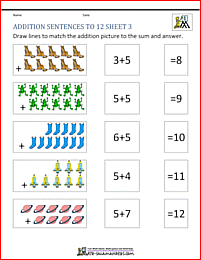 The last three sheets involve writing an addition sentence to match a picture. Looking for some easier addition sheets? 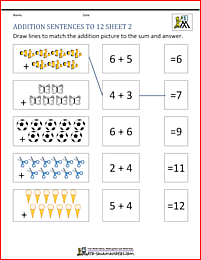 Our Kindergarten addition worksheets are similar to those on this page, but only go up as far as 10. 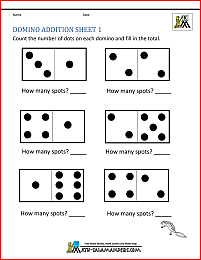 We also have a range of kindergarten counting and matching sheets. 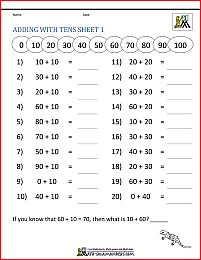 Looking for some harder addition sheets? 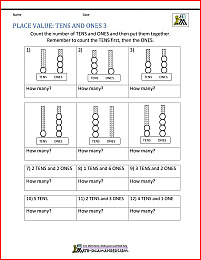 We also have a range of 1st grade addition worksheets which involve adding numbers up to 12+12 at a trickier level than the sheets on this page. 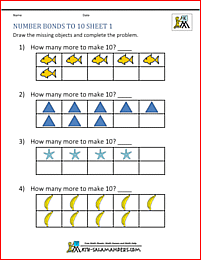 Take a look at some more of our first grade worksheets similar to these. 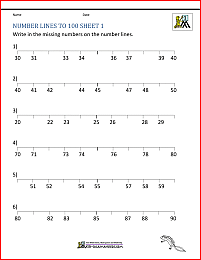 All the free First Grade Math Worksheets in this section support the Elementary Math Benchmarks for First Grade.